The City of Forest Park is an established middle class southern city. With the closing of Fort Gillem due to BRAC, and the redevelopment of the post, Forest Park will add 1,427 acres to its footprint. In the meantime, city leaders recognized that to capitalize on the economic investment and strengthen the town’s historic Main Street, some changes were needed. The Main Street District plan addressed the need to attract redevelopment to Main Street, and to guide that development away from the current suburban pattern. Main Street had evolved into a series of parking lots with no sidewalks and stores set back 30′ or more. It lacked visual appeal and was a hostile pedestrian environment. The master plan built on the considerable asset of existing green space, called for buildings to edge the street, and introduced a mix of uses to Main Street. Upon adoption of the master plan, a book of design guidelines was developed to govern materials, building placement, fenestration and the design of the public realm. To date, Forest Park has adopted zoning to implement and support the design guidelines. 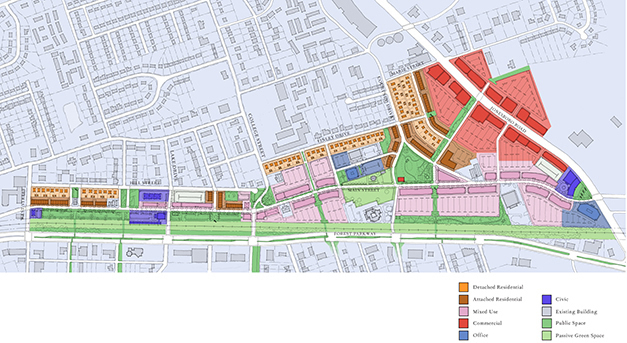 Land use map for redevelopment of the Main Street District. Main Street District network of green space builds off of existing linear parks found throughout Forest Park. Main Street District master plan envisions new commercial, residential, parks and transit. 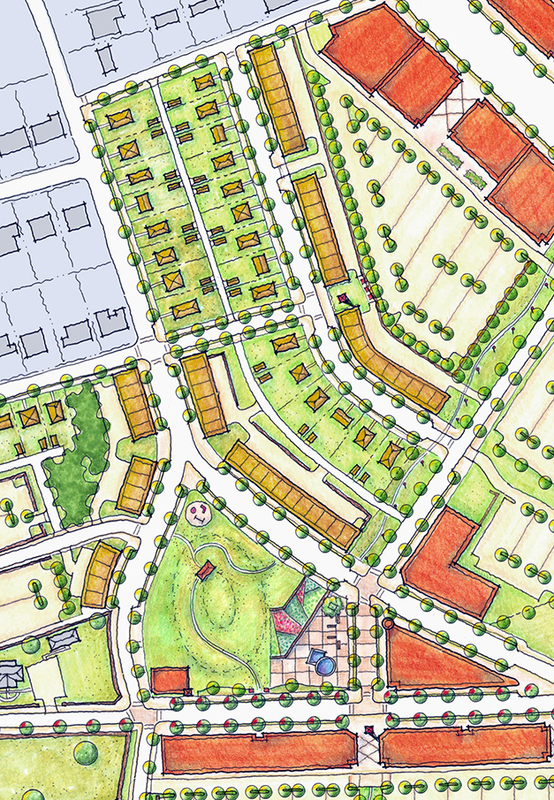 Townhomes and small lot cottages offer housing alternatives within the Main Street core.